Sarah and Brandon with their catch! 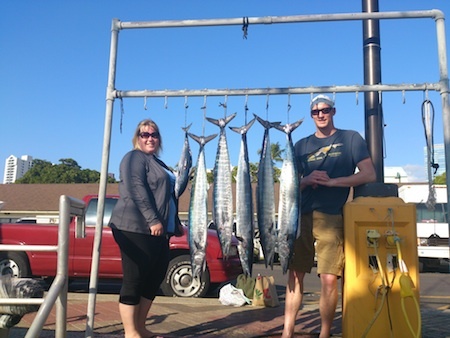 Mahalo to Sara and Brandon for choosing Maggie Joe Sport Fishing! 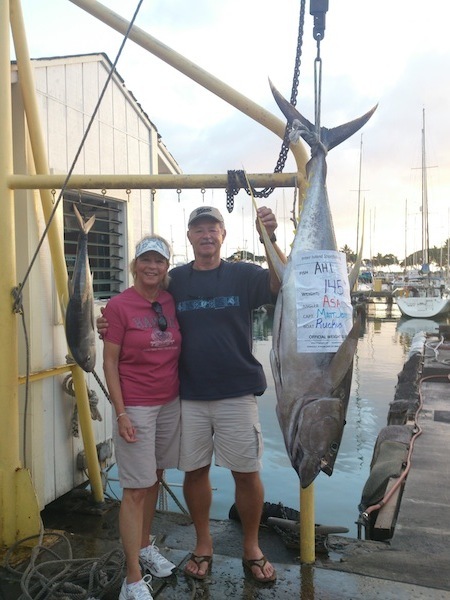 The couple hauled in 5 Ono while deep sea fishing off Honolulu, Oahu! Aloha! John, Lisa, Tyler, Solomen, Tom and Leland with 45 lb Ono and 2 Mahi Mahi! 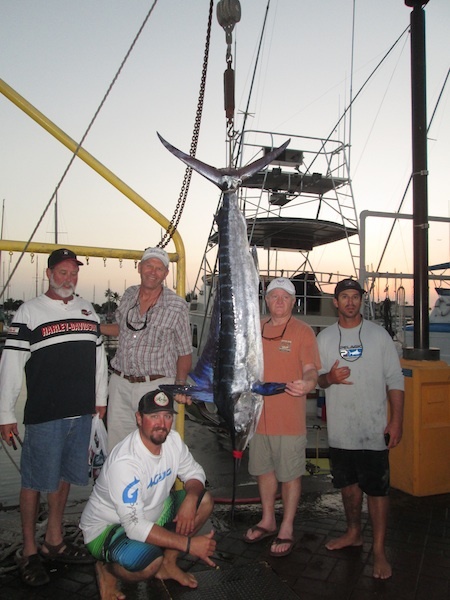 Mahalo to John, Lisa, Solomen, Tom and Leland for choosing Maggie Joe Sport Fishing. They hauled in a pair of Mahi Mahi and a nice 45 lb Ono while deep sea fishing off Honolulu, Oahu! Aloha! The Chrysalis’ and their Short Billed Spearfish! Mahalo to the Chrysalis’ for choosing Maggie Joe Sport Fishing! They hauled in this nice Short Billed Spearfish while deep sea fishing off Honolulu, Oahu! Aloha! 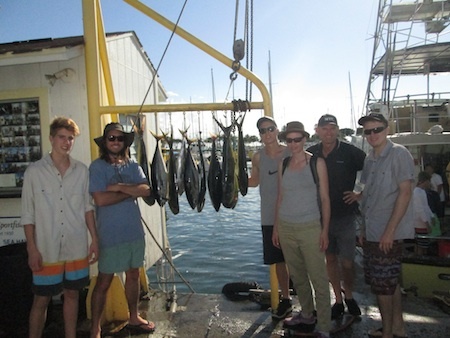 Kara,Chris, Harry, Stephan, John and Makenzie with 7 Mahi Mahi and 4 Shibi! 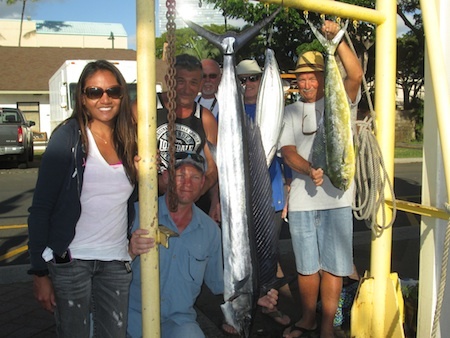 Mahalo to Kara, Chris, Harry, Stephan, John and Makenzie for choosing Maggie Joe Sport Fishing! 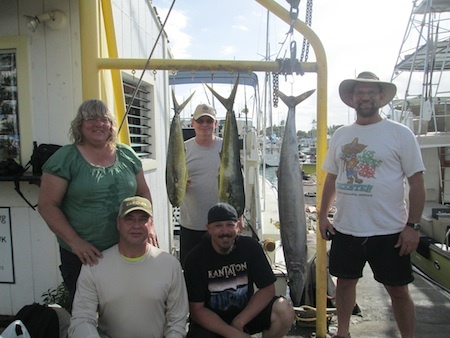 They hauled in 7 Mahi Mahi and 4 Shibi while deep sea fishing off Honolulu, Oahu aboard the Maggie Joe! Big Mahalo to Angler’s Justin and Jeff for choosing Maggie Joe Sport Fishing! They hauled in a nice Ahi and 607 lb Blue Marlin while deep sea fishing off Honolulu, Oahu. Captain Matt and Mate Morgan were crew. Aloha! Justin – Enjoy the that beast on your wall! The Van Den Dorpel family with their catch! Mahalo to the Van Den Dorpel family for choosing Maggie Joe Sport Fishing! 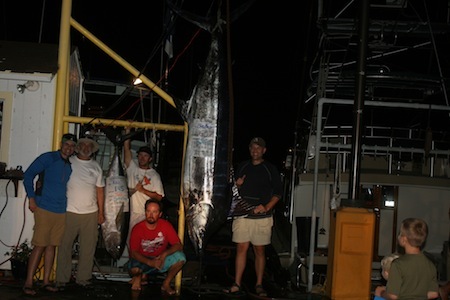 They joined Captain Mark aboard the Maggie Joe on a deep sea fishing charter. 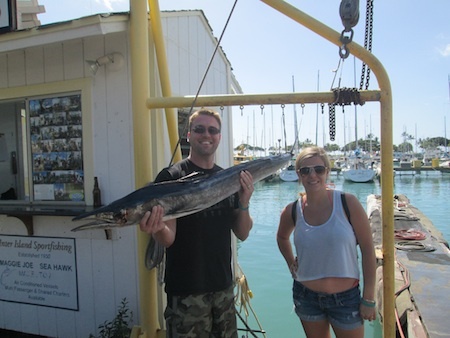 They hauled in a Short Billed Spearfish, Mahi Mahi and Aku while deep sea fishing off Honolulu, Hawaii! Aloha! 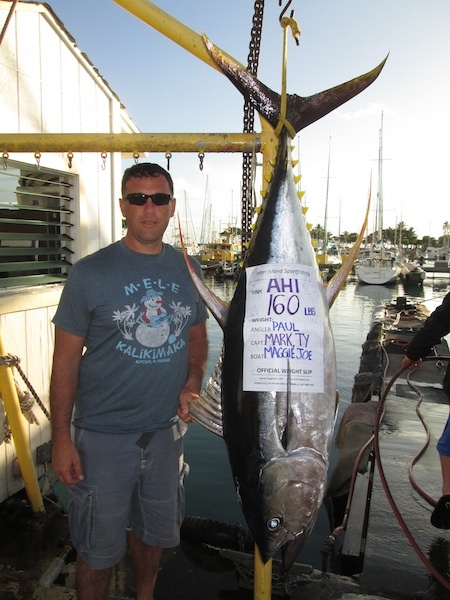 Mahalo to Paul for choosing Maggie Joe Sport Fishing! He joined Captain Mark aboard the Maggie Joe on a deep sea fishing charter. He hauled in this nice 160 lb Ahi while fishing off Honolulu, Oahu! Aloha! Chris with 170 lb Ahi! Big Mahalo to Chris for choosing Maggie Joe Sport Fishing! 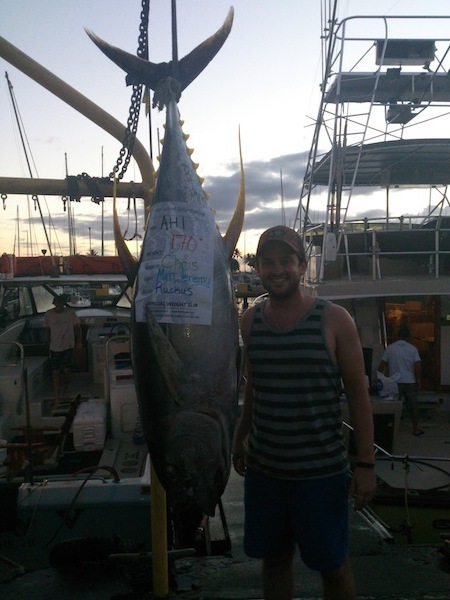 Chris hauled in this nice 170 lb Ahi while deep sea fishing off Honolulu, Oahu aboard the Ruckus! Aloha! Asa with 145 lb Ahi! Mahalo to Asa for choosing Maggie Joe Sport Fishing! He hauled in this nice 145 lb Ahi while deep sea fishing aboard the Ruckus with Captain Matt. Congratulations!